Mystery Chocolate Box July 2014 – Revealed! Greetings, fellow chocolate lovers, and welcome to the July Mystery Chocolate Box! If you were lucky enough to receive one of this month’s boxes, now it’s time to finally learn which what those bars that you enjoyed actually were. If you haven’t signed up yet, well, read on to get a feel for how our box works. We didn’t go for the super obscure, hard to guess bars this time (we’ll be getting into those in upcoming boxes). Instead, we stuck with more basic, simple bars this month. This bar seemed to be everyone’s least favorite, based on the feedback that we’ve received so far. However, we included this bar for a number of reasons. First, it contains Quinoa — a superfood packed with antioxidants, phytonutrients, complete protein, fiber, minerals and more calcium than cow’s milk! Second, this bar contains only 8 grams of sugar per serving (for comparison, a Hershey’s milk chocolate bar has 24 grams — 3 times as much!). Sugar is the only unhealthy ingredient in chocolate, so when you reduce that, you turn this from an unhealthy snack into a moderately healthy snack (as long as you don’t eat the whole bar at once!). Also, this bar is 70% cacao content, so it’s a perfect candidate for our Guide to Eating Chocolate For Weight Loss (or just general health). We even alluded to this bar at the end of this guide. Third, each square of this bar contains only 20 calories. Now, as you probably noticed, each square is quite small, so we don’t think it qualifies as a “low calorie” food, but it does make for easy portion control. So, what was this bar? So, if you still have more of Bar A but have been procrastinating eating it (we know you’re out there), now you know why you should finish it off! It’s good for you and can be a healthy snack. Product: Making sure the products they create are good for both the consumer and the supplier — ethical sourcing and fair trade. People: Their company is set up to provide a positive, team-oriented workplace and promote work-life balance for their employees. Partnerships: sweetriot partners with non-profits that promote culture and diversity in young people. This was the easiest bar to guess from the box. If you didn’t get guess this one (at least the flavor), either (A) you were trying too hard or (B) your taste buds took a vacation. Yes, good old mint chocolate. There’s a reason hotels (sometimes, but frustratingly not as often nowadays) put a chocolate mint on your pillow when they turn your beds down. What’s that reason? Mint chocolate is delicious. We hope you loved the cool, minty freshness of this bar. We sure did. Founded in 1991 by Craig Sams, Green & Blacks had the first certified Fair Trade chocolate bar in the UK. They focus on using only organic ingredients, sourcing their ingredients ethically, and using the highest quality ingredients possible. Taste wise, Bar C received the highest feedback by far. In fact, we almost didn’t send out Bar C because we wanted to keep them all for ourselves. Aren’t you glad we didn’t? This was a milk chocolate bar with something else added in perfect proportion to create a bar that you just don’t want to put down! Yum, cinnamon. And chocolate. That’s why this bar is so good. I suspect most of you don’t have any of this bar left over. In addition, here’s a guilt-reducing fun fact about this bar: it contains a whopping 7 grams of fiber per serving. That’s a LOT for a chocolate bar. 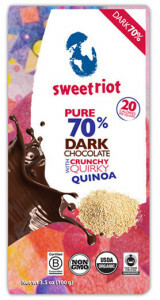 With the quinoa in Bar A and the fiber in Bar C, who knew eating healthy could be so delicious? It also has only 13 grams of sugar per serving, which is much less than most milk chocolate bars (remember the Hershey’s example — 24 grams!). New Tree believes in savoring life’s treasures, connecting with nature, and celebrating life. They view chocolate as a gift from the earth and a wonder to be explored. Their mission is to help you discover new ways to savor life through things like amazingly delicious chocolate bars. How did you like this box? We want to know! How did you like these bars? Were you able to guess them correctly? How did you enjoy them with your family and friends? Let us know in the comments — we’d love to hear from you! The Mystery Chocolate Box Team. No Replies to "Mystery Chocolate Box July 2014 - Revealed!"